In addition to starring in “Chilling Adventures of Sabrina” (Netflix, streaming), which just unleashed its second season, Kieran Shipka stars as a hearing impaired teen in the streaming service’s latest movie, “The Silence” (Netflix, streaming), a thriller about creatures who attack humans by tracking sound. It’s a plot similar to the one in the movie “A Quiet Place,” but it’s adapted from the 2015 Tim Lebbon novel of the same name. 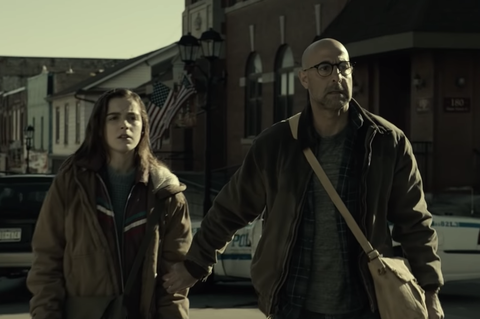 Miranda Otto (who is also in “Sabrina”), costars as her mother; Stanley Tucci is her dad. John Corbett, Kate Trotter and Kyle Breitkopf round out the cast. (Possible warning: Early reviews are not good). Bear Grylls returns with more outdoor adventuring in remote locations. But on the interactive series “You vs. Wild” (Netflix, streaming), viewers get to choose the course of the story. In time of environmental crisis, how about a little back-patting? The special “Ozone Hole: How We Saved the Planet” (PBS, 10 p.m., check local listings) recounts action taken in the 1980s. Another popular hole in the sky gets a first look in “Monster Black Hole: The First Image” (Science, 10 p.m.). Plundering seems to be hot on cable these days. The newest series “Mummies Unwrapped” (Discovery, 10:13 p.m.) begins with dining up an underwater grave. The truce between the vampires and Staten Island’s werewolves is tested on a new “What We Do in the Shadows” (FX, 10 p.m.). Opening night of the cabaret is closing night for season four of “Schitt’s Creek” (POP, 10 p.m.). Amanda Peet returns to “Brockmire” (IFC, 10 p.m.), except that she’s dating his old friend George Brett. Tribal council heats up on “Survivor” (CBS, 8 p.m.). “Jane the Virgin” (CW, 9 p.m.) has a new challenge to meet. The Lyon family tries to support Andre’s health concern while not canceling the tour on “Empire” (Fox, 8 p.m.). The health of “Star” (Fox, 9 p.m.) is taking a turn for the worse, too. “Last Week Tonight with John Oliver” did a good job showing how the WWE doesn’t support wrestlers in retirement; apparently there’s more downsides to the fake grappling on “Dark Side of the Ring” (Viceland, 9 p.m.). Haley’s plan to elope goes awry on “Modern Family” (ABC, 9 p.m.). On “Schooled” (ABC, 8:30 p.m.), there’s an attempt to change the mascot. Erica tries out for “Jeopardy!” on “The Goldbergs” (ABC, 8 p.m.). “The Real Housewives of New York” (Bravo, 9 p.m.) are up in the Berkshires. Angie and Will’s binge watching is interrupted on “Single Parents” (ABC, 9:30 p.m.). On “The Magicians” (Syfy, 9 p.m.), Quentin argues with a plant. There’s a going away party for Mama Bae on “Black Ink Crew” (VH1, 9 p.m.). “SEAL Team” (CBS, 10 p.m.) encounters a bomb attack while training Filipino SEALs. Will’s new girlfriend joins the team on a mission to Spain on “Whiskey Cavalier” (ABC, 10 p.m.). The “CNN Presidential Town Hall” (CNN, 10 p.m.) tonight features Washington governor Jay Inslee. There’s an Easter egg hunt on “Happy!” (Syfy, 10 p.m.). “Full Frontal with Samantha Bee” (TBS, 10:30 p.m.) has a new episode. Three straight nights of amateur sleuths on Turner Classic Movies concludes with “Manhattan Murder Mystery” (8 p.m.), “Fast Company” (10 p.m.), “After the Thin Man” (11:30 p.m.), “The Ex-Mrs. Bradford” (1:30 a.m.), “Having Wonderful Crime” (3 a.m.), “Mr. and Mrs. North” (4:15 a.m.) and “Haunted Honeymoon” (5:30 a.m.). Earlier are films about romance and climbing the ladder to success with “Goodbye, Mr. Fancy” (6:30 a.m.), “The Girl Who Had Everything” (8:30 a.m.), “A Life of Her Own” (9:45 a.m.), “Invitation” (noon), “Tea and Sympathy” (1:30 p.m.), “The Young Philadelphians” (3:45 p.m.), and “Payment on Demand” (6:15 p.m.). The Stanley Cup Playoffs begin their months’ long campaign with first round play of Columbus at Tampa Bay (USA, 7 p.m.), Pittsburgh at Islanders (NBC Sports, 730 p.m.), St. Louis at Winnipeg (NHL, 8 p.m.), Dallas at Nashville (USA, 9:30 p.m.) and Vegas at San Jose (NBC Sports, 10:30 p.m.). NBA action has Orlando at Charlotte (ESPN, 8 p.m.) and Utah at Clippers (ESPN, 10:30 p.m.). There is also the WNBA draft (ESPN2, 7 p.m.; ESPNU, 8 p.m.). Baseball includes Yankees at Houston (MLB, 7:30 p.m.). The Masters has its Par 3 Contest (ESPN, 3 p.m.). College baseball has Purdue at Indiana (Fox Sports 1, 7:30 p.m.). Kelly Ripa and Ryan Seacrest: Hank Azaria, Justin Hartley. The View: Justin Hartley. The Talk: Nikolaj Coster-Waldau, Skee Washington. Ellen DeGeneres: David Spade, Sara Bareilles. Wendy Williams: Milla Jovovich. Stephen Colbert: Anderson Cooper, Ruth Wilson, Rep. Ilhan Omar. Jimmy Kimmel: Jeremy Renner, Camila Mendes, Alice Merton. Jimmy Fallon: Drew Barrymore, Lily Collins, Terry Gilliam, Best Coast. Seth Meyers: Sam Rockwell, Jodie Comer, Kiana Ledé. James Corden: Nikolaj Coster-Waldau, Sara Bareilles. Carson Daly: Stephen Root, CaveTown, Emmy Raver-Lampman. Trevor Noah: Oprah Winfrey. Conan O’Brien: Sean Penn.